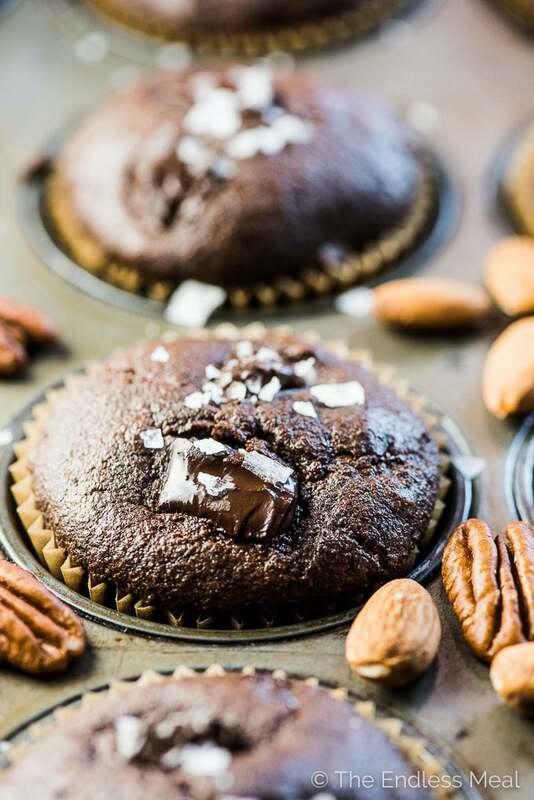 Chocolate Almond Flour Protein Muffins that are healthy enough for the breakfast table and delicious enough for dessert. With over 11 grams of protein and all healthy ingredients, they're a muffin recipe that is truly the best of both worlds. Yes, you can have your cake and eat it, too. (cause why the heck would you just sit around looking at it?) 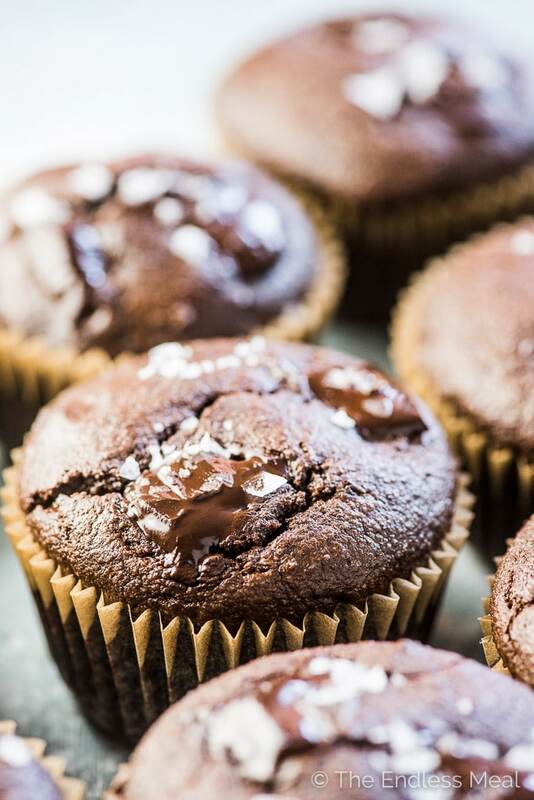 Only these ‘cakes' are chocolate protein muffins that are the most delicious things you'll ever meet yet somehow they manage to be good for you, too. I don't know how they do it. They should be called Magic Muffins. Since they're packed with over 11 grams of protein in each muffin, we'll stick with calling them Protein Muffins. ← tell it how it is! Coffee + chocolate dessert anything is just awesome. Hello, happy mornings. Your kiddies will gobble these up without complaint. Hello, even happier mornings. Weekday breakfast meal prep that will make you look like a rockstar. 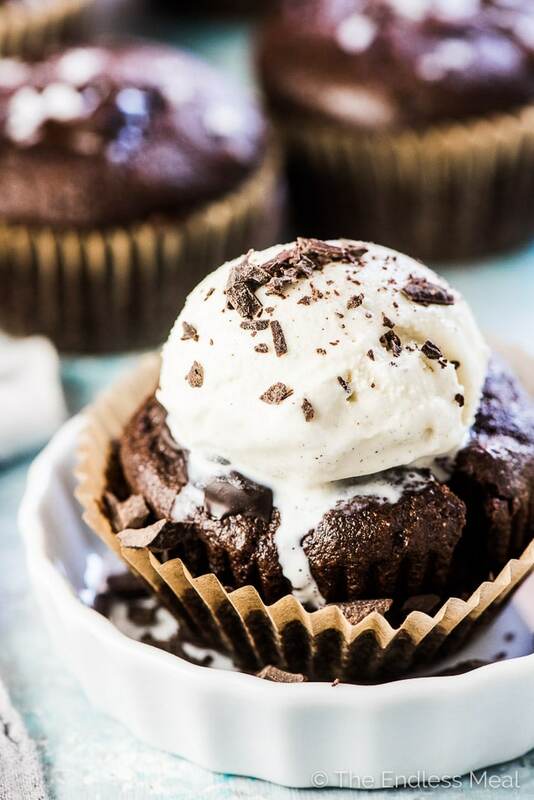 These protein muffins are double duty desserts. Warm one up in your oven after dinner then pop a scoop of your favorite vanilla ice cream on top of it. ← please do this. you can thank me later. You're looking at the most delicious way to get your daily fix of Vital Proteins Collagen Peptides. 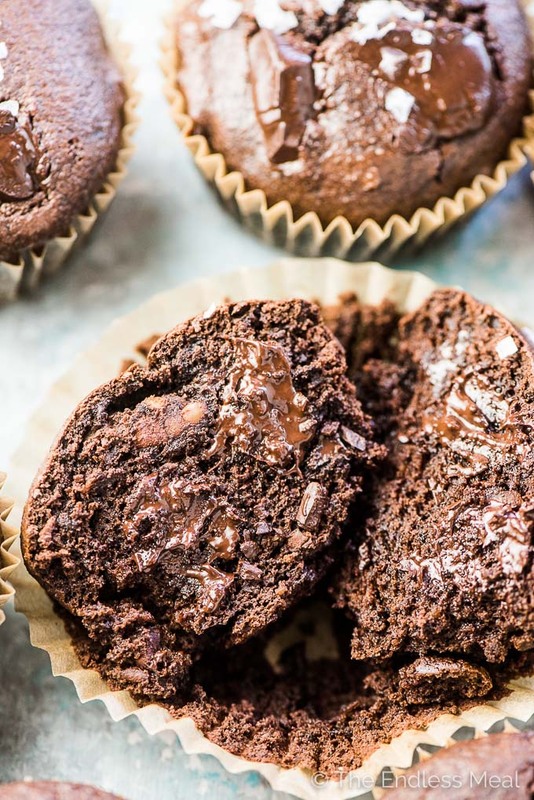 Sure, you could put a scoop or two in your coffee or smoothie (as I often do) but adding it to your chocolate breakfast muffins just seems like a much better (and tastier) idea. One of the best parts about these protein muffins is that they are ridiculously easy to make and virtually impossible to mess up. These protein muffins are no different. Gather your ingredients and mix them all together. And I'm hardly exaggerating. Super fudgy, soft in the center muffins that have dessert written all over them: 12-14 minutes. Firm muffins that hold their shape and pack well: 18-20 minutes. I like to aim for right in the middle and cook them for 16-17 minutes for muffins that are soft and a little delicate but can still (carefully) be kept on hand for grab and go breakfasts. 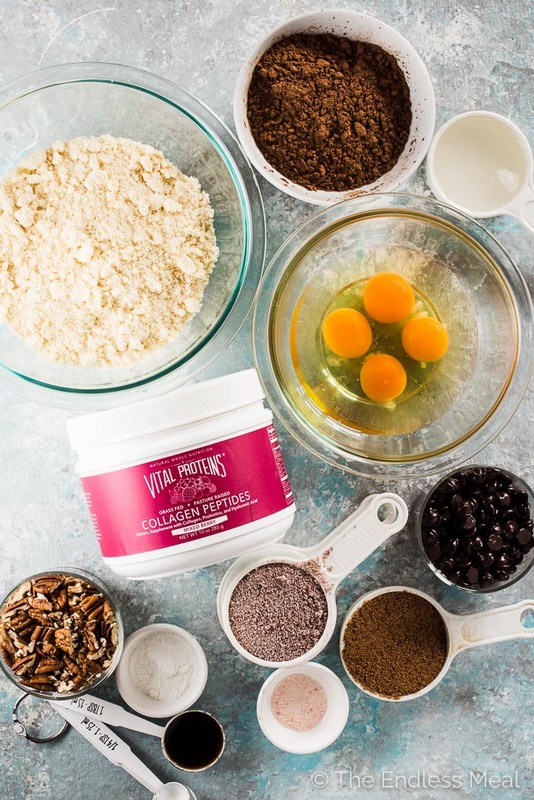 One of my favorite ‘tricks' for bumping up the protein in recipes is to add a few scoops of Vital Proteins Collagen Peptides. Not only do you get an extra 9 grams of protein per scoop, you get all the health benefits of collagen. Collagen is super important for optimal health. Our grandparents use to get a lot more of it in their diets by making their own bone broths. In our fast-paced lifestyle filled with boneless, skinless chicken, we get very little collagen in our diets naturally. It's why I take Vital Proteins Collagen Peptides. I started taking it religiously every day about a year ago and have noticed that my joints don't feel as sore after long runs. Vanity bonus: my skin, hair, and nails are so much better now, too! Most days, I add 2 scoops to my coffee. ← I know that sounds SUPER weird but you can't taste it at all. But I also love to add it to recipes. See what I mean? Big time love for Vital Proteins! 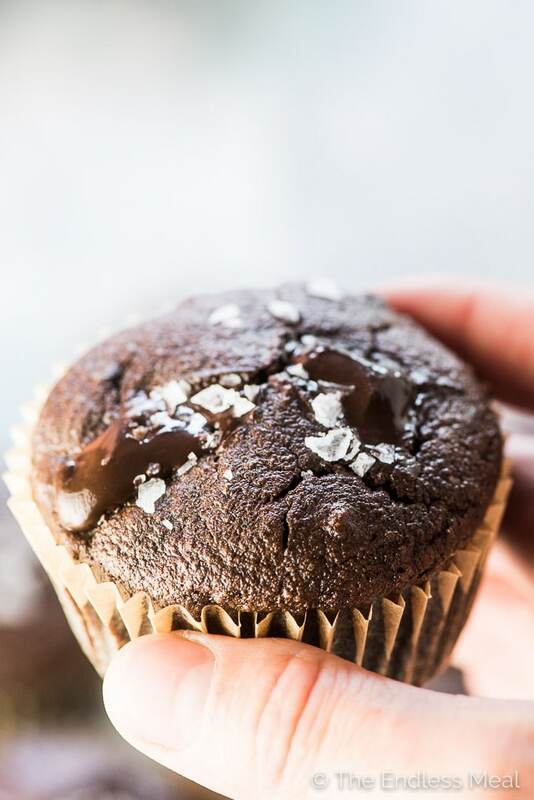 Chocolate Almond Flour Protein Muffins that are healthy enough for the breakfast table and delicious enough for dessert. They're a muffin recipe that is truly the best of both worlds. Preheat your oven to 350 degrees. Line a 12-cup muffin tin with liners. Add the coconut sugar, coconut oil, eggs, and vanilla to a large bowl and beat with electric beaters. Add the almond flour, cocoa powder, Vital Proteins Collagen Peptides, baking powder, and sea salt and beat until just combined. Add the hot water and carefully beat it into the batter. Fold in the chocolate and pecans. Divide the batter between the lined muffin cups, filling them nearly to the top. For extra chocolaty muffins, top with a few chocolate chips or chunks. Bake the muffins for 12-20 minutes – see the guidelines below. Let the muffins cool for 5 minutes before removing them from the muffin tin. Optional: top with a little sprinkle of flaky sea salt. 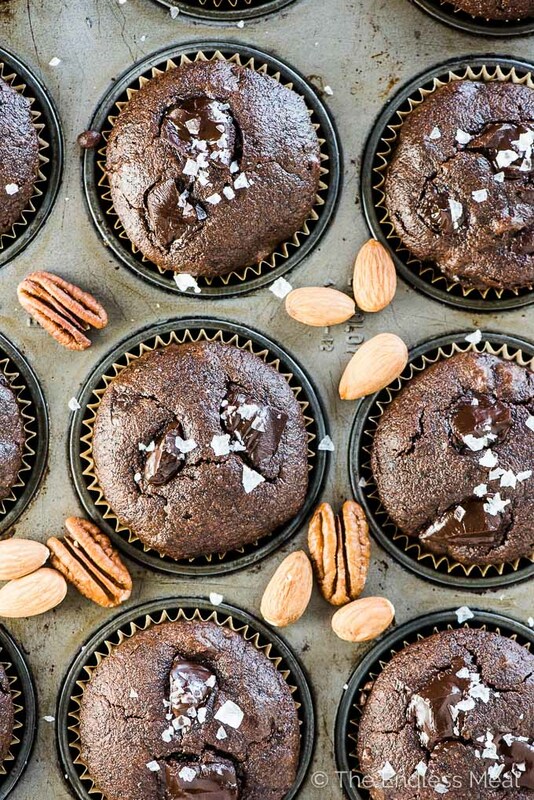 Fudgy dessert muffins: 12-14 minutes. Soft and delicate muffins that hold their shape: 16-17 minutes. Firm muffins that hold their shape: 18-20 minutes. To prevent the muffin liner from sticking, make sure to let the muffins cool completely before taking it off. These muffins are the best! 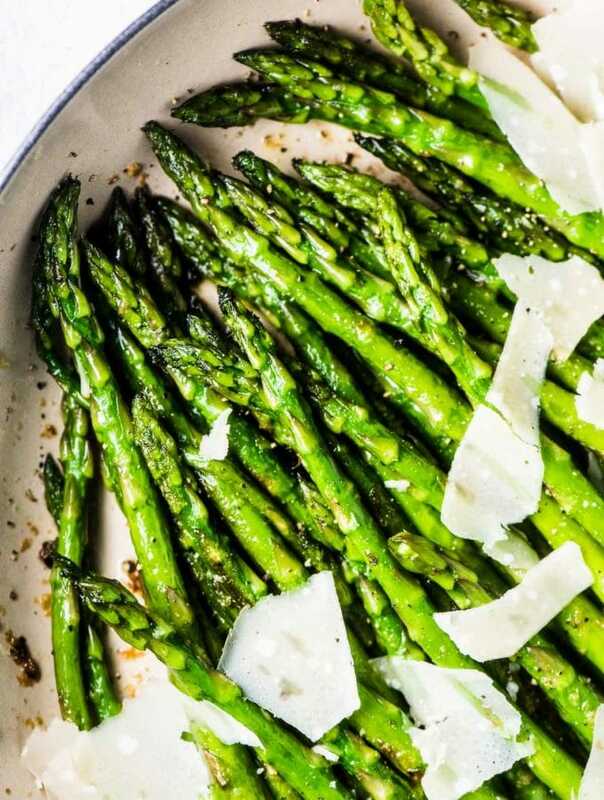 Will check out your other vp recipes for more inspo. I’m happy to hear you like them as much as we do! So for people like me who may or may not be addicted to chocolate. Would a full cup of chocolate chips be too much? I’m so glad you broke down the timing so you get your muffin exactly how you want. Fudgy muffins are life so I’m glad I know exactly how long much time is need! 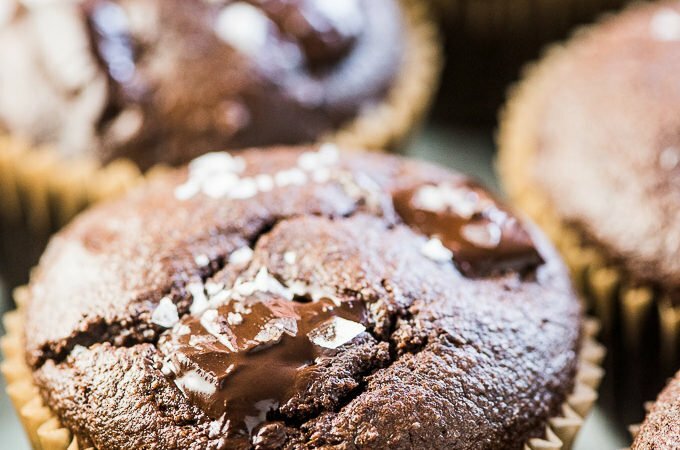 Fudgy muffins are the best, aren’t they?!! Muffins are my FAVE, especially blueberry or lemon poppyseed muffins! Chocolate muffins taste more like frosting-less cupcakes to me. Nothing wrong with that, but I find them more suitable for dessert than breakfast! However, I still wouldn’t turn down chocolate for breakfast. Thus, these muffins might just be calling for me to make them and dig in! Exactly! These could totally be eaten as dessert! I’m so happy to hear you like them!! Have been reading your blog for ages, though I confess I have never cooked any of your cakes. The reason? I live in a metric world, plus your units like cups are volume-based (cup), not weight based (gram). Therefore 1 cup of honey is not the same weight as a cup of sugar. If I can still risk with your fusion salads or dishes, I need some guidance for the sweets. How many grams in a cup? Then, why do you still use coconut oil, though it is being denounced as harmful? 1 cup of almond flour is 96 grams – or at least that is what Google told me. 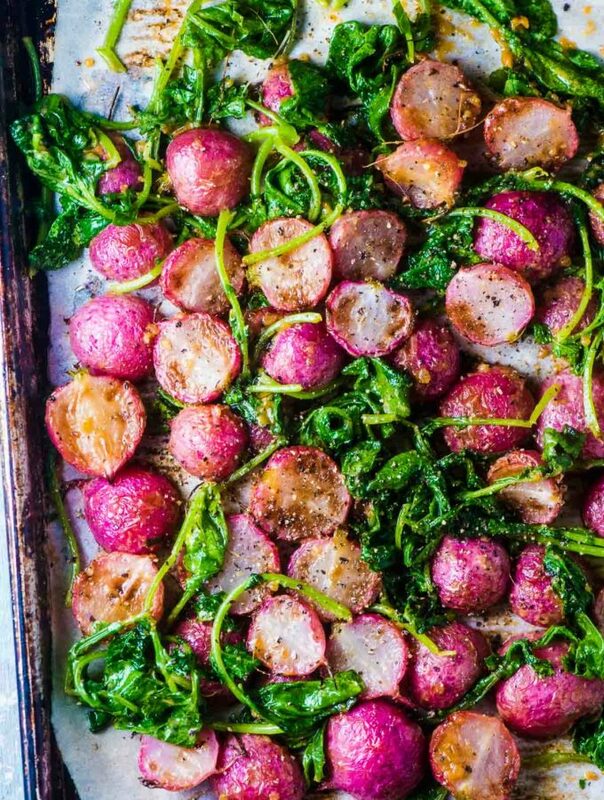 This is a really flexible recipe so the exact amount isn’t super important. Hello! Can you make this without the collagen stuff or will it not bake right? I have all the other ingredients! The recipe will work without the collagen, but you’ll miss out on the extra protein and other health benefits. Definitely worth picking up some Vital Proteins for your next batch! Hi, Can I replace the collagen with my protein powder? 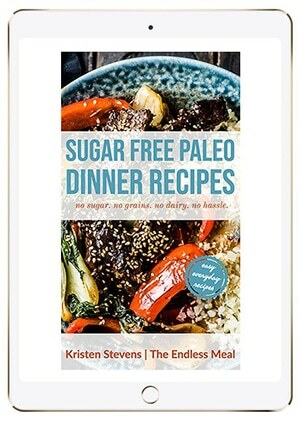 I have never tried baking with protein powder so I’m really not sure how it works in recipes.